The legendary novel whose true events inspired the film KILL YOUR DARLINGS In the summer of 1944, a shocking murder rocked the fledgling Beats. William S. Burroughs and Jack Kerouac, both still unknown, we inspired by the crime to collaborate on a novel, a hard-boiled tale of bohemian New York during World War II, full of drugs and art, obsession and brutality, with scenes and characters drawn from their own lives. Finally published after more than sixty years, this is a captivating read, and incomparable literary artifact, and a window into the lives and art of two of the twentieth century's most influential writers. "In alternating chapters, Burroughs and Kerouac serve up a noir vision of Manhattan... Of the two, Kerouac, then in his early 20s, is the more developed writer, though Burroughs, an absolute beginner, already shows some of the interests and obsessions that will turn up in Naked Lunch and elsewhere, to say nothing of an obviously field-tested understanding of how syringes work... For his part, Kerouac recounts wartime experiences in the Merchant Marine, along with notes on the bar scene that would do Bukowski proud." 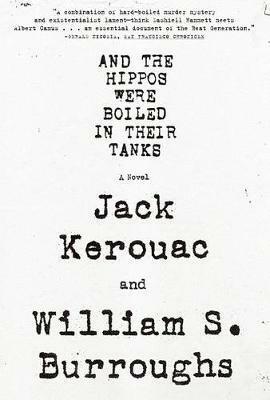 "[Hippos] significantly predates Kerouac's major novels and illuminates his dynamic and productive literary friendship with William S. Burroughs. ... it is very charming. ... The conceit of switching back and forth between narrators every chapter also keeps things speeding along--it creates the illusion that one is listening to a radio broadcast from one station, only to have the frequency changed every few minutes, with the narrative sometimes overlapping and the two voices bleeding into another." "If you care about either of these beat masters ... I don't see how you can fail to enjoy [And the Hippos Were Boiled in Their Tanks]. Slight as it may seem at first glance, it's an invaluable document of literary history, glimmering with nascent genius." "An eccentric, engaging, and readable novel... What makes the novel particularly fascinating, however, is its ability to provide a window into the early autobiographical styles of both Burroughs and Kerouac as emerging, unpublished writers." "As an insight into the formative years of the Beats, it's fascinating."